We are actively engaged in manufacturing an extensive range of Sofa Canvas Cover for catering the diversified requirements of our clients. Backed by a team of experts and well equipped production facilities, we offer a large variety of Canvas Cloth. These are made as per the set market norms and principles in variety of sizes and patterns to cater to the need of our customers. Our items are accessible in unique pattern and diverse attractive colors. 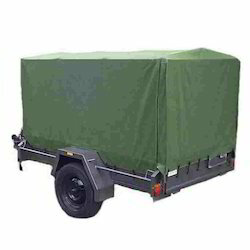 Light weight but Tough & Durable Car Covers ready available in 120 GSM & 90 GSM Silpaulin in Blue, Yellow OR natural Colour. Canvas Covers also available for all Cars Maruti 800, Esteem, Zen, Premier Padmini, Premier 118 NE, Tata Estate, Tata Sierra, Ambassador etc.